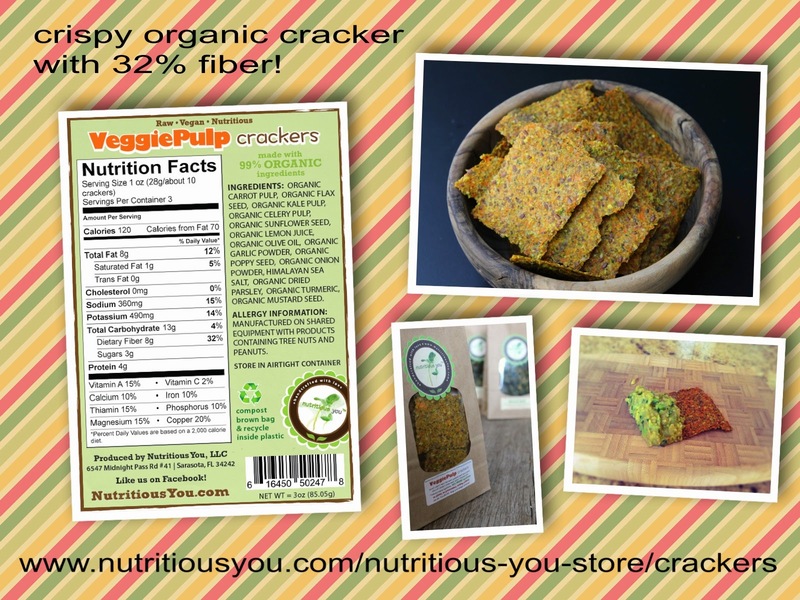 Our latest updates from the Nutritious You Shop! ✨ Nutritious You Shop & Ship section of the website has been updated, please check it out. All the products you see there are available for purchase and we ship anywhere in the continental USA. ✨ We added 3 bistro tables to our shop (one inside and two outside) so now you can enjoy your breakfast and lunch right here with us! ...finally! ✨ We are extending our hours of operations to 4 pm. One Hour Initial Consultation $75. 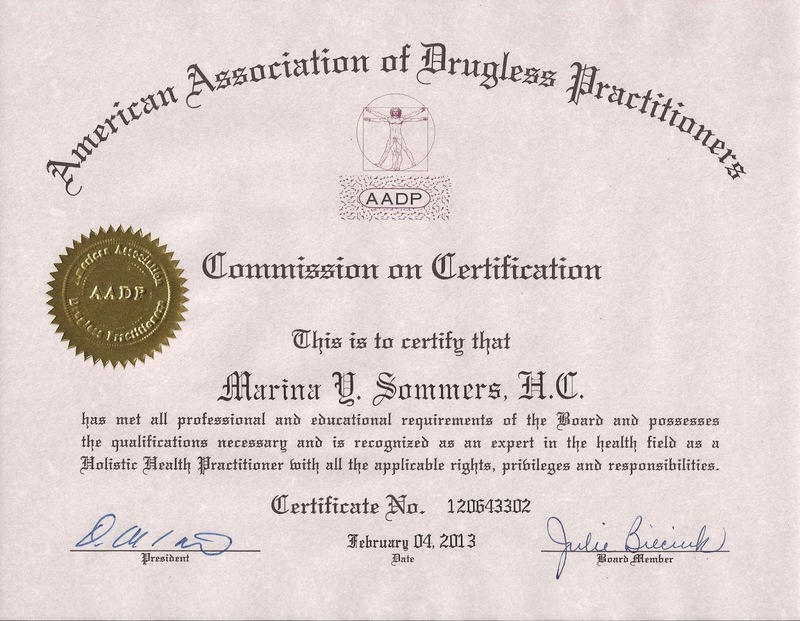 Offered in order to assess an individual's health goals/concerns and develop a plan to reach those goals. An individual program might be recommended after this meeting. One, two, or three recommendations would be given at this time. This consultation can be done in person, via phone, or skype/facetime. Three days worth of food supply (breakfast and dinner) made out of organic ingredients. Seven days mentoring and plan adjustment if needed over the phone, text. A personal folder with detailed instructions, grocery list, recipes, and supplements suggestions. Next time you decide to detox, you won’t even need me! 4. At least one week of continuing transition back to your regular diet. 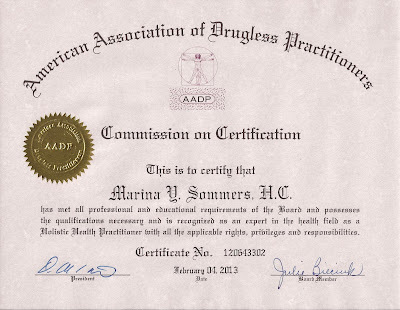 One Hour Initial Consultation ($75) where we assess your health and wellness goals and determine if this program is right for you and if you would benefit working with me. One, two, or three recommendations would be given at this time. Six 50 minute sessions $450 where we meet bi-weekly to discuss your health goals/concerns, your progress and recommendations. Mentoring of your progress and working together step-by-step on improving the areas of your greatest concern. Examples that will vary depending on your goals: preventative solutions, nutritional knowledge and healthy tips, energy levels improvement, digestive health, decreasing mild ailments, smart grocery shopping, nutritious cooking, healthier eating habits, de-junking your pantry, achieving the lifestyle you always imagined for yourself, healthy lunch box ideas, learning to read labels, learning new healthy foods, upgrading your medical cabinet with natural solutions, and more. Mentor/accountability partner, available by email in between the sessions. Notes, handouts, CDs, books, food samples, and other materials. Highly customized approach where we adjust the direction of the program depending on your immediate needs. Bringing new healthier habits to your lifestyle, creating new daily routine. Discounted price for the groups of up to 5 people. One Month Health Makeover Program is offered on limited bases. $75 for initial consult and $150 for the program. Option 1. Half a day workshop (or workshop series) is available for groups of 3-10 people. It includes meditation, meal preparation, a nutrient packed branch with Q&A, a take-home binder with all the recipes included, and handouts. Available Monday through Friday. Please use contact form to request a specific day. Option 2. 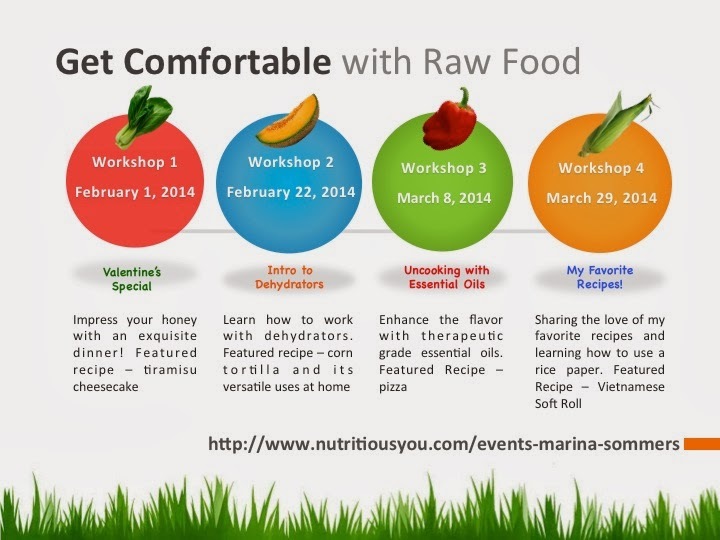 Host raw food workshop at your home. Free for you. Five guests minimum (including one host). All sessions start on time and end on time. The hour cannot be extended because a client is late. You will only get a full benefit from the sessions if you allow for a full 50 minutes scheduled time. You can reschedule your session at least 24 hours in advance so not to loose your session time. The prices are subject to change without notice. To confirm your program/session, a payment and a signed agreement should be submitted a day before the meeting. 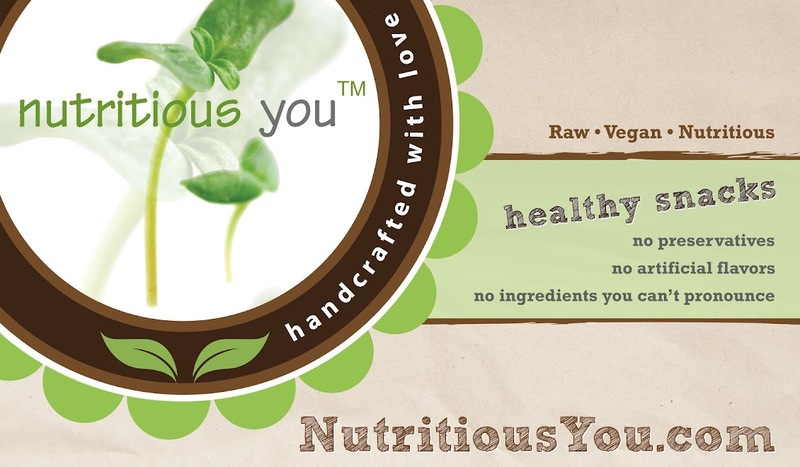 Nutritious You is a new product line of healthy snacks created by AADP certified health coach, Marina Sommers. Marina’s original production goal was to fill a void in local food market offerings by creating a snack that was both healthy and tasty to her children. Today, the mission of the Nutritious You team has evolved to provide nutrient-packed snacks to health-conscious consumers across the nation. 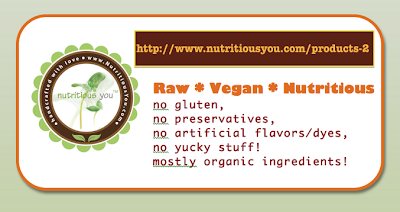 Nutritious You products do not have: preservatives, artificial flavors, dyes, chemicalized ingredients, food-like products created in a lab, any kind of yucky stuff that our immune system doesn’t recognize! Nutritious You Products have: high quality premium certified organic ingredients that come from the land, from our Earth. The only ingredient that is not certified organic is our fabulous Himalayan pink salt. 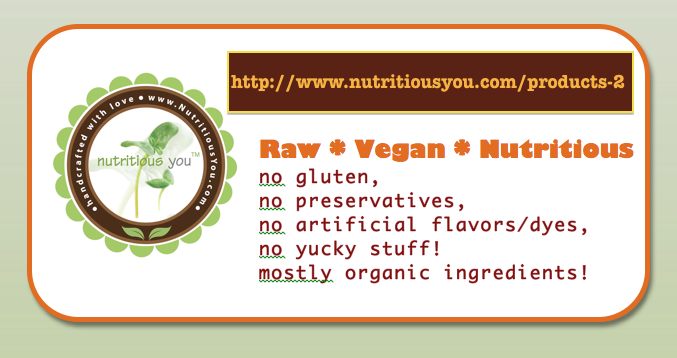 Nutritious You products are plant based. They are carefully handcrafted with love. The production process combines high quality organic vegetables, seeds and nuts. We soak and grind most of our seeds and nuts for better digestibility (less anti-nutrients, more bio-availability). We use filtered, pH neutral-to-slightly alkaline water for soaking. The products are then dehydrated below 118 degrees Fahrenheit to preserve nature’s nutrients. It takes from 24 up to 48 hours for a cracker to turn into a crispy savory delight. The result is a high-fiber, nutrient-packed, raw and vegan product composed of 99% certified organic ingredients. Yes, the process is lengthy but you are worth it! This is what makes our products so nutrient rich. As one of the well-known health experts, Dr. Joel Furhman puts it, “Eat foods that are rich in micronutrients!” Check out the first eight most nutrient-dense food groups here in his chart. We love what we do. We create guilt-free yummy snacks and desserts for your pleasure and nourishment! Today, Nutritious You products are well established in Sarasota, FL. 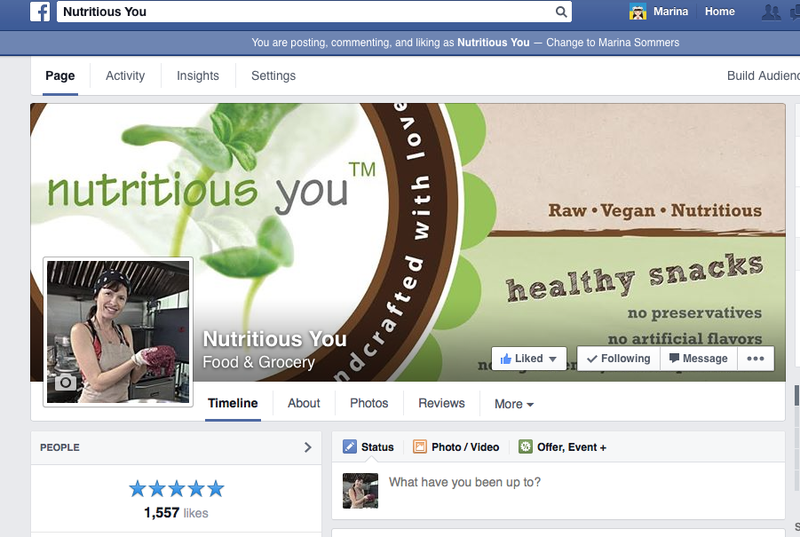 Nutritious You is actively seeking retailers and distributors to expand to new markets. Is it Atkins? Is it Paleo? Is it vegetarian? Or is it a Gluten Free? Dr. Joel Fuhrman is one of the most respected experts in the health and wellness industry and the author of bestselling books on nutrition. He suggests consuming food groups that are rich in micronutrients. When the body receives plenty of micronutrients, it starts to clean itself of a variety of ailments while getting all of the ingredients necessary for healthy operation. Additionally, it’s a great way to prevent nutrient deficiencies. Micronutrients are vitamins, minerals, antioxidants, phytonutrients, and enzymes. When our diet is full of these, we don't have to worry about ailments. Macronutrients are also necessary for our survival. This includes proteins, fats, and carbs. 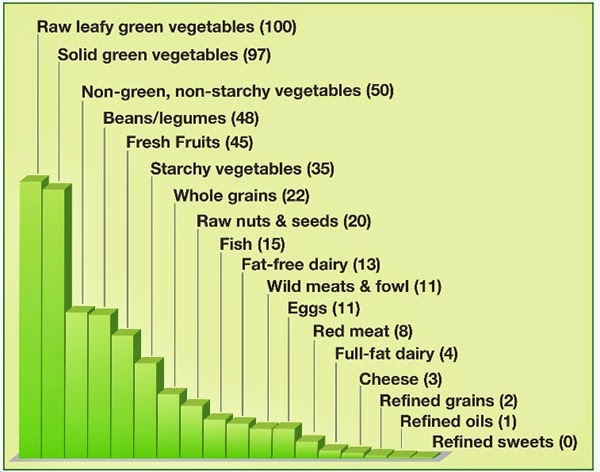 You don’t have to worry about being deficient in macronutrients, per Dr. Furhman’s suggestion, as the foods that are rich in micronutrients already have an appropriate amount s of healthy fats, carbs, and proteins for us humans. Whatever diet you choose, stay away from refined sweets, even if the package says “All Natural” and “Gluten Free”! 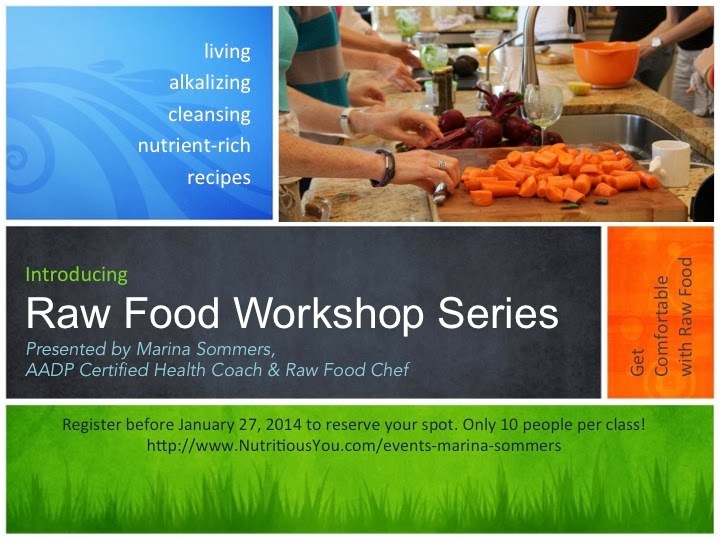 An amazing event is coming up for #NutritiousYou #HealthySnacks. The countdown begins today and it's getting more exciting as we start packaging the boxes to be shipped to Baltimore! anywhere in the United States!!! FOLLOW US ON FACEBOOK! for the latest updates! Brand New Workshop Series in Sarasota, FL! You asked, I listened. Instead of one, I am offering four workshops in a row this year! Sign up for all four and safe $60! These are the only workshops I am planning in 2014. Increase amount of life-force giving recipes in your kitchen. Get comfortable with new healthy ingredients and start using them on daily basis. Enrich your plate with nutrient-packed and YUMMY food! Impress your honey with an exquisite dinner! Featured recipe – tiramisu cheesecake. February 22: Intro to Dehydrators. Learn how to make a popular item on the Veg restaurant’s menu. Featured recipe – spinach tortilla and its versatile uses at home. Enhance the flavor with therapeutic grade oils. Featured Recipe – pizza. March 29 My Favorite Recipes! Sharing the love of my favorite recipes and learning how to use a rice paper. Featured Recipe – Vietnamese Soft Roll. 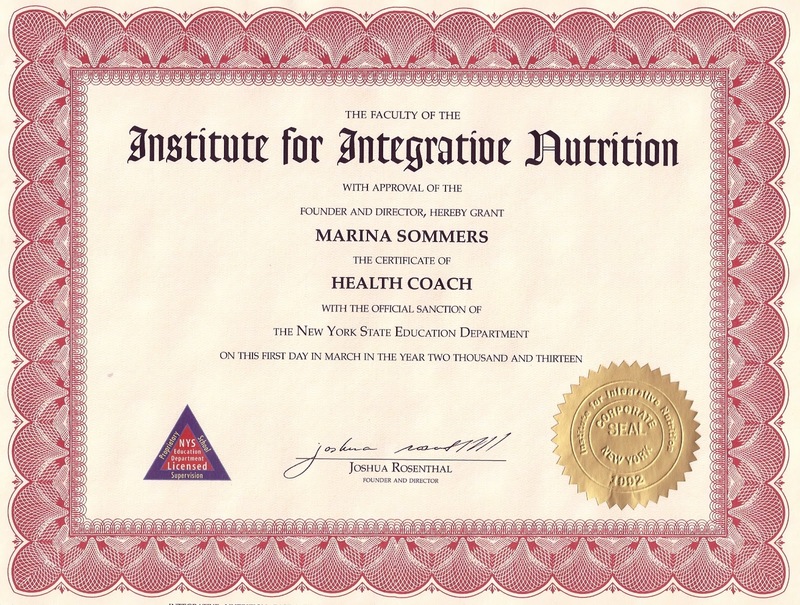 Marina Sommers, holistic health and wellness coach hasn’t always been a healthy food junkie. It all started when she and her family moved to Siesta Key, Florida. The natural beauty of the island and the beach evoke her passion for nutrition and a healthier lifestyle. At the same time her daughter developed an acute condition of Geographic Tongue. Certain foods made it very difficult for her to eat. Several months of trying to find a cure proved to be futile. Marina realized there had to be a drastic change for the better. She finally decided to move the whole family to a strict organic whole food based diet, without gluten, white sugar, white flour, preservatives, dyes, artificial flavors or any other laboratory made food-like products. To Marina’s amazement, her daughter’s tongue was healed in two weeks! All the spots were gone. This is where the new journey began. Marina started creating her own treats in alignment with her family’s new diet, at the same time still wanting her daughter to have the tasty treats that kids enjoy. This is how Nutritious You™ Treats came to life. Marina’s ultimate goal is to bring her healthy treats to as many families as possible. Forget sacrificing taste for health. She is committed to providing natural, healthy and nutrient filled foods so there is NO GUILT, while indulging on favorite flavors or textures. Marina is dedicated to creating foods that are not just better for you, but good for you. All our treats never go to high temperatures to preserve what’s nature has created. Subscribe to Nutritious You Updates! Get Rid of Your Mucus! How much veggies/fruits/nuts/seads do you consume on daily basis?